Red Monkey Theater Group (RMTG)—Mount Saint Vincent’s resident theater company—presents the Pulitzer Prize-winning drama Water by the Spoonful by Quiara Alegría Hudes, Saturday, February 2 through Sunday, February 10 in Cahill Theater. Water by the Spoonful is a powerful, compassionate story about the search for meaning. The play centers around Elliot, a Puerto Rican veteran of the Iraq war who struggles to find his place in the world. His story runs parallel with those of four individuals who connect in an online chatroom for recovering addicts. The performance explores their experiences with trauma and recovery, as well as their connections with their families and the online community. The play is directed by Rachel Tamarin and the cast features Alex Lugo, Kat Peña, Jessica Carmona, Ibrahim Traore, Holly Jian, Clinton Powell, and Kenneth Laboy Vasquez—and RMTG welcomes back Mount alumna Alexis Peterson ’16 for the production, who takes on the role of stage manager. Water by the Spoonful is the fourth production in RMTG’s 20th season, “The Haunted Season.” This season presents a collection of plays in which the group explores characters who are haunted by ghosts—both symbolic and literal—and forced to confront the buried sins, failures, and secrets that loom over their lives. Up next is The Seagull by Anthon Chekhov, coming to Cahill Theater in April 2019. For tickets, directions, and a full listing of the season’s programming, please visit redmonkeytheater.org. Founded in 1999, Red Monkey Theatre Group (RMTG) is the resident theater company of the College of Mount Saint Vincent in Riverdale, N.Y. A nonprofit performing arts company operating out of Mount Saint Vincent’s Cahill Theater, RMTG is dedicated to enriching local communities through the cultivation, creation, and presentation of live theater. Company members have trained with the Royal Shakespeare Company, the National Theater Institute at the Eugene O’Neill Theater Center, the Moscow Arts Theater, Lincoln Center Theater, and other diverse institutions and programs. 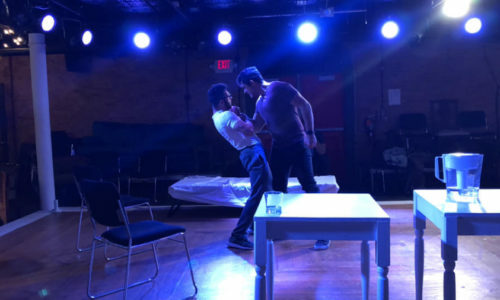 Past productions include the company’s original dramatic adaptation of Dostoevsky’s The Brothers Karamazov, which enjoyed a month-long run at the Mazer Theater on the Lower East Side of Manhattan. The group’s productions have toured throughout Westchester and the Bronx for the past several seasons, and RMTG shows have appeared as part of ArtsWestchester’s acclaimed Live at the X performance series. RMTG also collaborates with M&M Productions to present a series of site-specific Sherlock Holmes adventures at Lyndhurst, a historic gothic revival estate in Tarrytown, N.Y.